All that childhood reading has contributed to a sense for flavors and which will be complementary (on both the savory and sweet side). While I don’t have the most adventurous palate (“delicacies” are not my thing), I do think it’s fairly sophisticated. I can tell by the way a recipe is written whether it’s great or just serviceable, and I know when it will work and when it won’t. On the weekend I made a chocolate cake using a recipe from a respectable source. 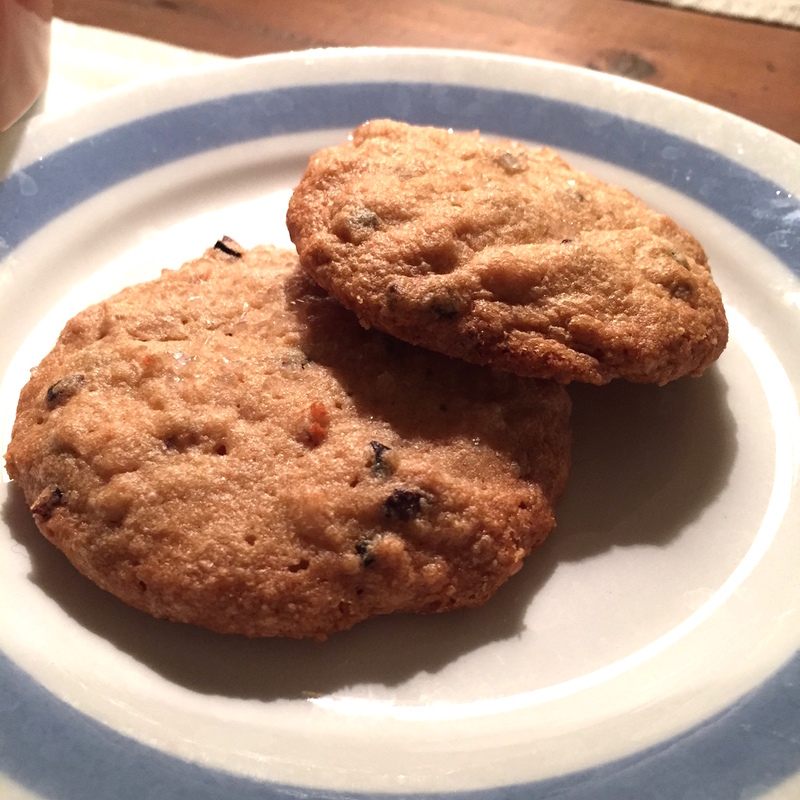 I had reservations – it called for cocoa and buttermilk which don’t harmonize for me – but since it was only one stick of butter, I gave it a go. Oy, friends. Bad. 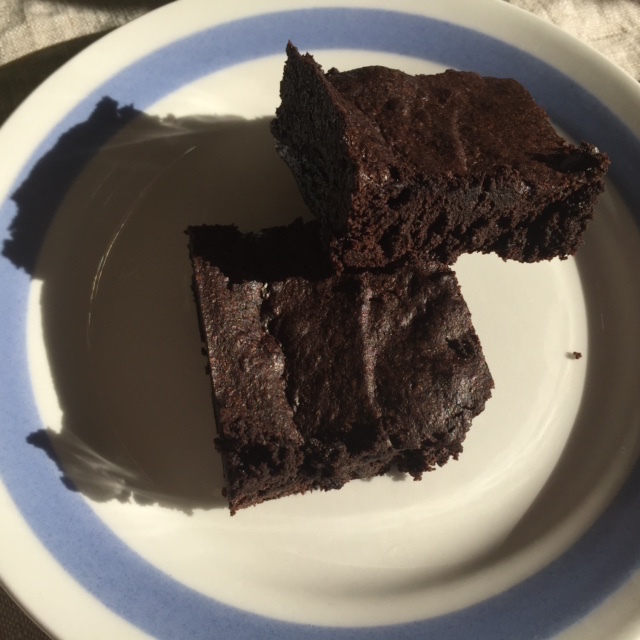 The overly sweet batter tasted “chocolaty” and the cake was…. Well, it was pretty: Dark. Good crumb. Good texture. It just tasted terrible. Thinking it might be my palate, I offered it around. No one cared for it. Well, one of my neighbor’s said, “It’s good. But I don’t want any more of it.” I let it sit for a day, loosely wrapped in plastic, to see if anything would meld or bloom. No. Bad. I trashed it (along with, apparently, all photos of it). Lesson: Trust yourself. In the kitchen and in life. So then I had the rest of a quart of buttermilk. And it is autumn, which calls for cozy, which calls for bread. 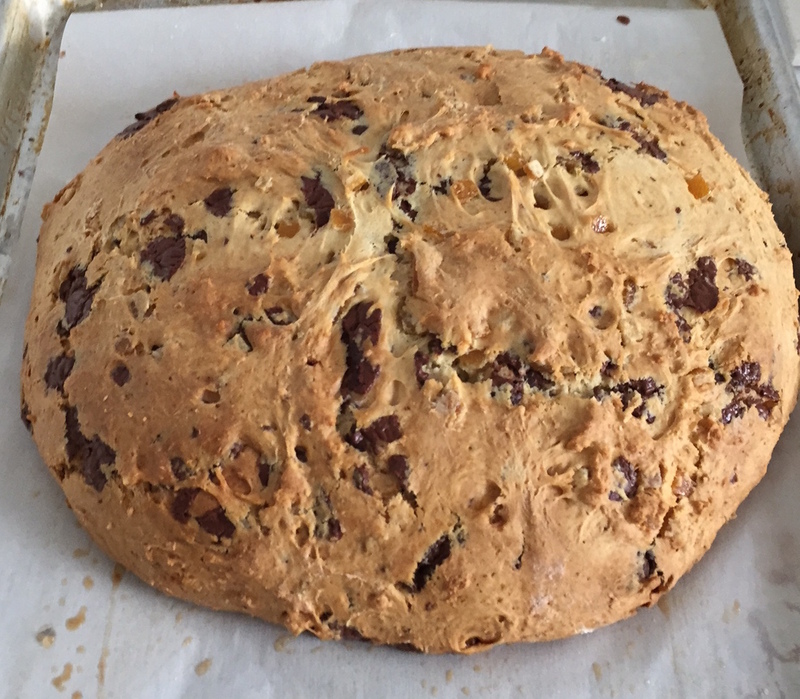 Specifically Dark Chocolate Orange Soda Bread. Super easy, super fun, and super delicious. You can never go wrong with chocolate and orange, and it’s bread! Who cares if I have to run the AC in order to turn on the oven? This is a recipe from Epicurious. I don’t make any changes to it. 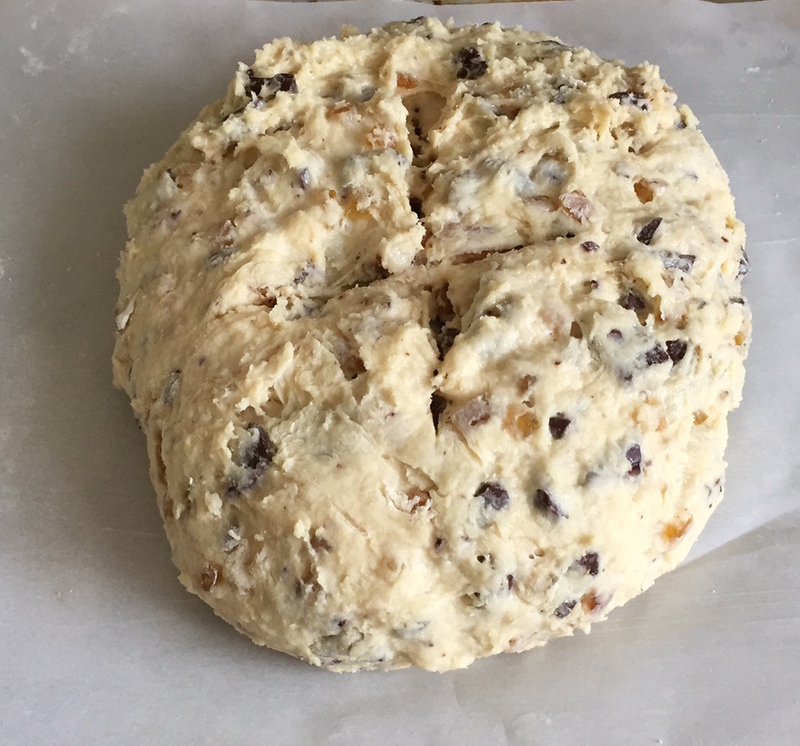 The dough is sticky sticky sticky. Scarily so. Be brave, dear reader, and don’t add a ton more flour to make it easier to handle! Just roll it around on your lightly floured work surface until you can take your hand off it without taking half of it with you. It can be done. I have a “vintage” kitchen that has tiled countertops (the horror! ), so I work on a marble slab. 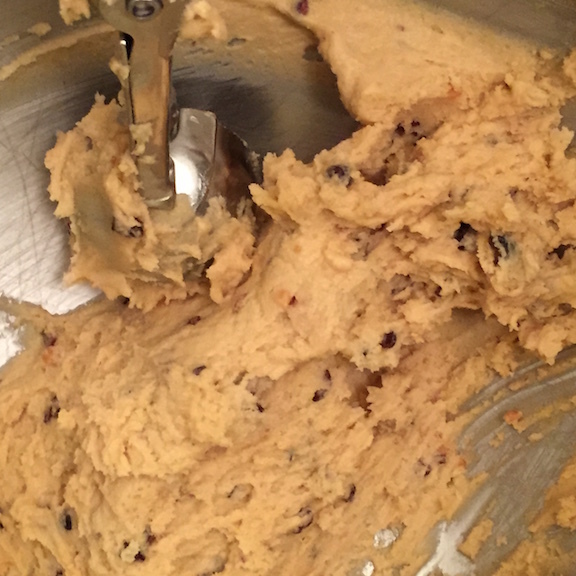 And use a bench scraper to nudge my mound of dough off the marble and onto the prepared baking sheet. I first made this last December for a holiday event. The dough was so crazy sticky that I just mounded it onto the sheet and said a prayer. Holy patron saint of bakers, is this stuff delicious! I mean seriously. For its ease and nothing fancy ingredients, it comes together like a trip to heaven. 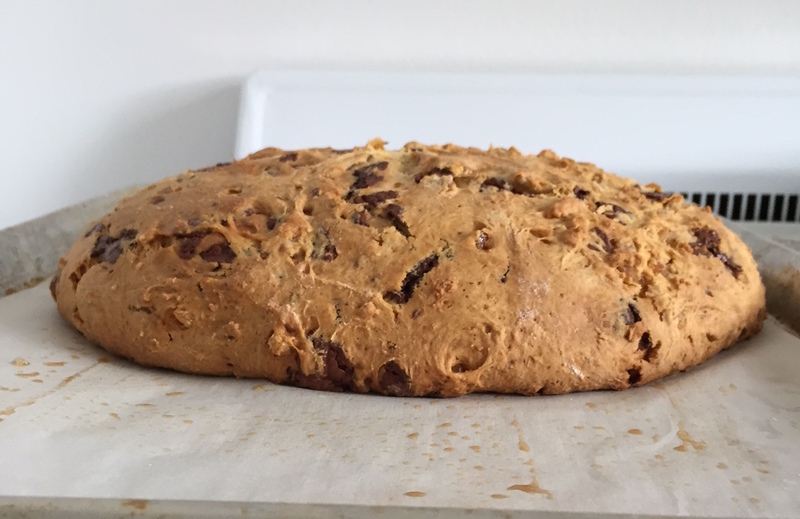 I’d never made soda bread before. I think I’d had it once at a St. Patrick’s dinner 30 years ago and that version was too rusk-like for me. The chocolate and orange drew me in like a moth to a flame. And, turns out, that 30 year old memory? That was just a bad loaf. 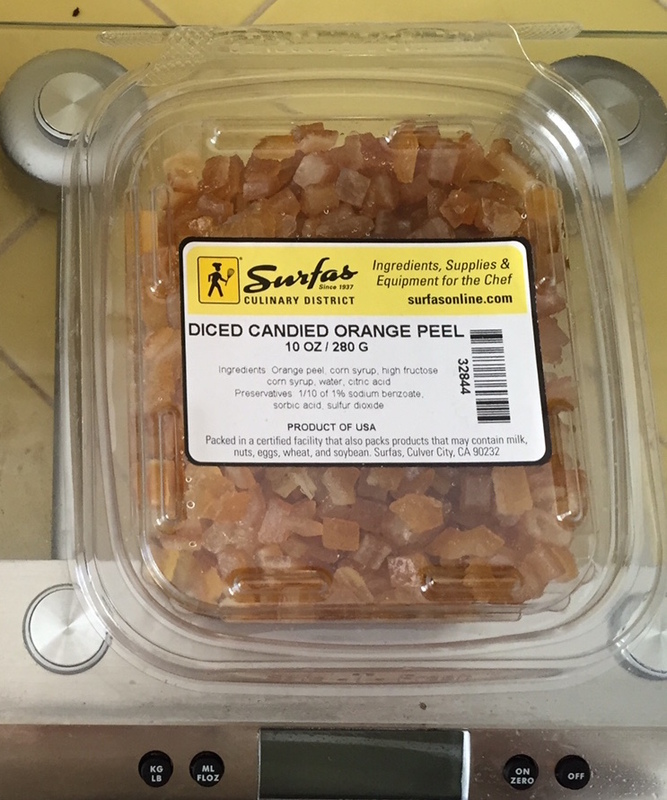 As to ingredients, I use Valhrona Manjari 64% coarsely chopped and candied orange peel from local cooks’ store (oft mentioned here), Surfa’s. I’ve made this bread many times since, using orange peel from the Berkeley Bowl (similar to Surfa’s) and from the supermarket. The supermarket tubs (usually available only around the holidays) are a sweeter, stickier product. 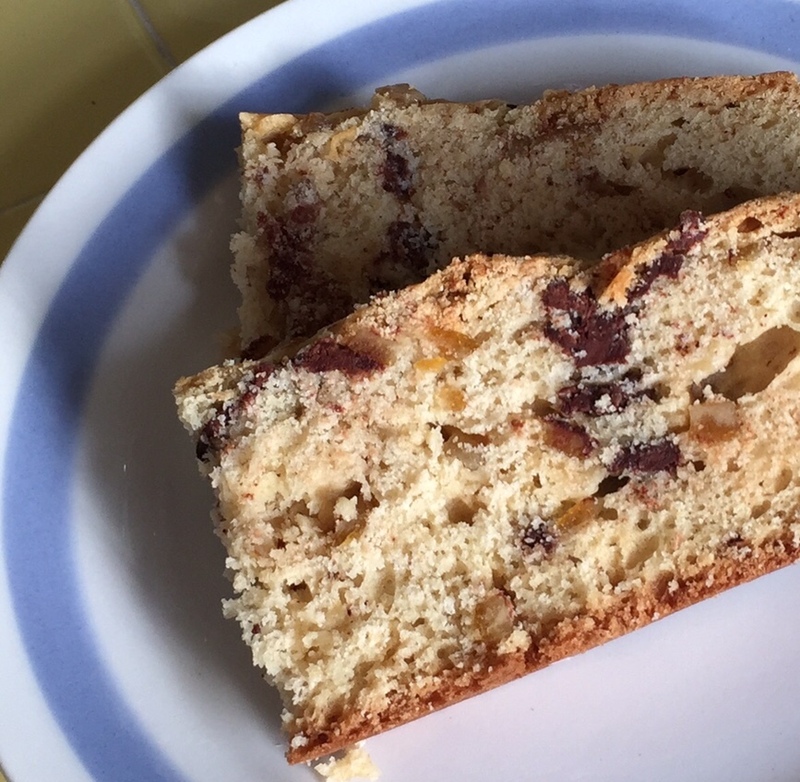 The orange bits tend to clump together in the bread, but it still tastes wonderful. Important: Mind the time! Because the dough is so difficult to manage, my loaves have turned out differently every time. Sometimes wider and flatter, sometimes taller and more compact. The recipe calls for 70 minutes baking. I have never needed that much time, neither when using a fancy calibrated Wolf range nor when using the Home Depot special oven in my current place. The loaf needs to be brown, firm, with a tester coming out clean. Check it at 40 minutes. I’ll be surprised if you need more than 60 total. It tastes as wonderful regardless of how the loaves appear. It’s best to let this bread fully cool before cutting. Then you can slather it with butter, toast it, do whatever you like to do with bread. Baked up with a little vanilla custard, it also makes a nice bread pudding. This baby will take you straight from Halloween through Thanksgiving, Christmas and New Year’s brunch. Position rack in center of oven and preheat to 350°F. 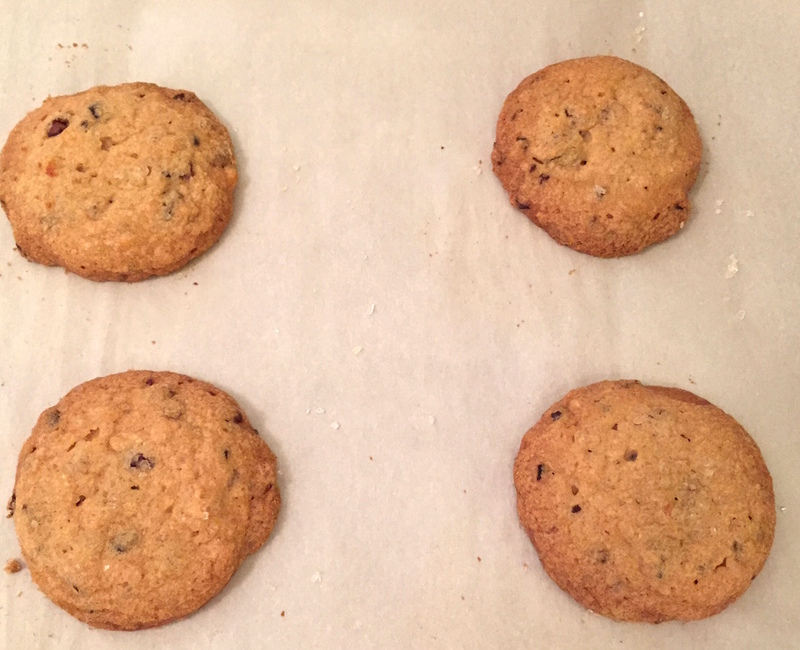 Line rimmed baking sheet with parchment paper; butter parchment. Whisk first 5 ingredients in large bowl to blend. Add butter; rub in with fingertips until mixture resembles coarse meal. Stir in chocolate and orange peel. Whisk buttermilk and egg in medium bowl to blend; add to dry ingredients. Stir just until incorporated. Candy. Candy candy candy. I reflexively think of myself as a candy lover but when I visit places like Dylan’s Candy Bar, I’m overwhelmed by colorful options and fruity aromas. I’ll eat Red Vines (or Twizzlers as we call ‘em back home), Mary Janes, and the occasional Dot. But what I’m really after are the M&Ms, Reese’s, Snickers, and Milk Duds. So, OK, I like chocolate. As distinct from candy. So where do the twain meet? In toffee. And why not? Such a delectable happy marriage. Full disclosure: Wrap chocolate around sugar cooked anywhere between 245° and 290° F and I’ll eat it. But toffee is special. Buttery maybe? With the chocolate and the nuts? I love it and will enjoy everything from an Almond Roca all the way to fancy artisanal products. I’m not beyond paying $15 for 8 ounces of handmade goodness. Like I did this week. OK, the only people sitting around with me were a dog and two cats who don’t eat toffee but I like to think they’re impressed by my efforts. It was one of those nights – I want something, what do I have on hand? Brown sugar, butter, chocolate, almonds. Always in the pantry. It takes about 20 minutes. The toffee hardens almost immediately, the chocolate takes some time. So when wanting instant gratification, I put the tray in the fridge for 15 minutes. Nom nom nom. In writing this piece, I thought about my earliest toffee memories. While not toffee per se, what I remember is Callard & Bowser Butterscotch. It came in a white package wrapped in cellophane. Each piece was a tablet about an inch long wrapped in foil. I think my grandfather turned me on to this, it seems like he always had it on hand. I’m not generally into butterscotch (you can keep your Werther’s and your Pick-A-Mix disks), but this was something altogether different. Heavy on butter, light on sugar. I came across this lovely ode to the C&B Butterscotch on candyprofessor.com, which is itself a lovely blog that appears to be not currently active. She expresses the wonders of this wonderful confection better than I could. Trust your thermometer, but verify. Boil water and put your thermometer in. Account for any degrees above or below 212°F or 100°C. Chocolate. Less is more with the darkness here, IMO. I use Valhrona Manjari (64%) or Caraibe (66%). If the chocolate is too dark, I feel like that’s all I taste. Almonds. I don’t toast them. And I use less than suggested. I’m not in it for the nuts. Prepare your workspace. Pre-measure your vanilla and baking soda and set near the stove. Set your prepared baking sheet nearby as well. I set up an assembly line of stove – potholder on counter – pre-measured vanilla and baking soda – prepared baking sheet. Once the sugar syrup is the right temperature, speed is of the essence. Line a rimmed baking sheet with a Silpat or butter generously, and set near the stove. Set your pre-measured vanilla and baking soda nearby as well. Sprinkle about half the nuts over a 7 x 10 inch area on the cookie sheet. Set it near the stove. Have the vanilla and baking soda nearby as well. In a heavy-based saucepan, preferably nonstick, combine the brown sugar, water and butter. 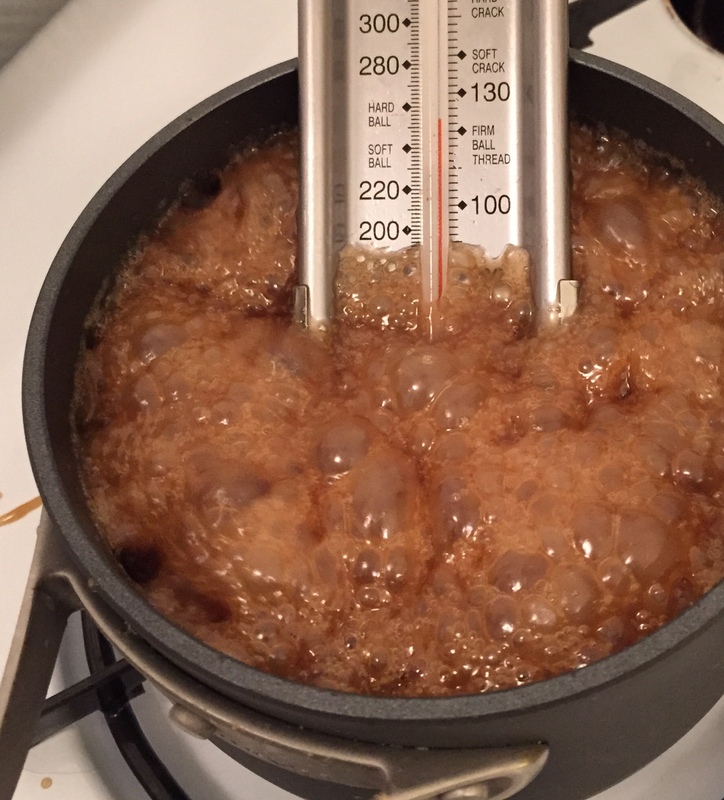 Bring to a boil, stirring constantly (trying not to disturb the thermometer), until the mixture reaches 285°F on a candy thermometer. Mind the heat: The first few times I made this, I had the heat too high and the syrup cooked too fast and scorched. While Burnt Caramel is trending in ice cream, it’s not so nice in toffee. Medium high heat, please. Immediately remove the saucepan from the heat [onto the potholder] and stir in the vanilla and baking soda. 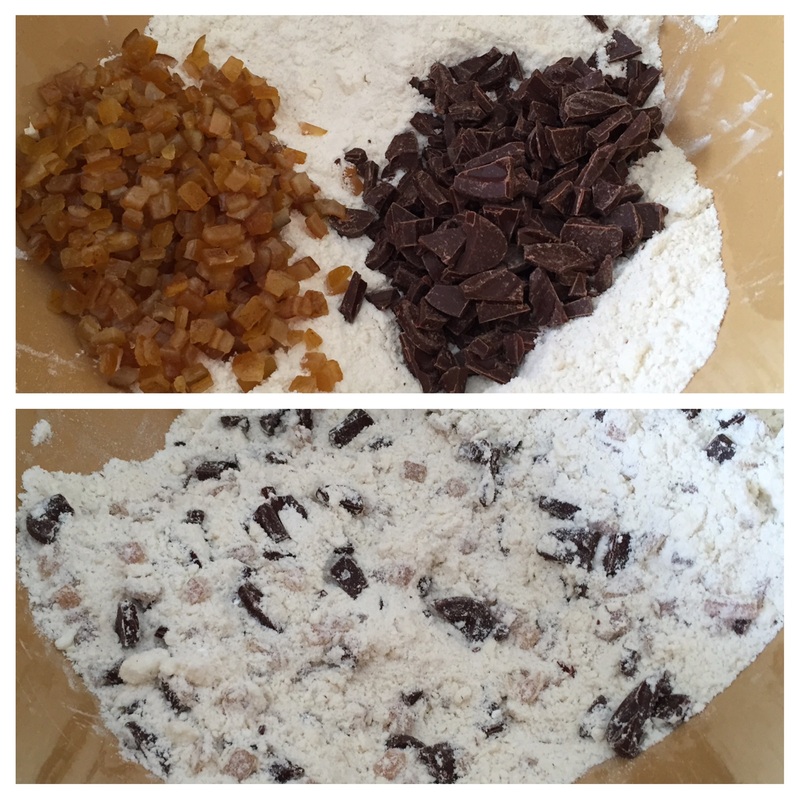 Pour the toffee mixture carefully and evenly onto the nuts, keeping within the 7 x 10 rectangle. Working quickly, scatter the chocolate onto the toffee. Press the chocolate lightly with your fingertips so it starts melting. Let it sit for five minutes so the chocolate is soft enough to spread in an even layer over the surface of the toffee. 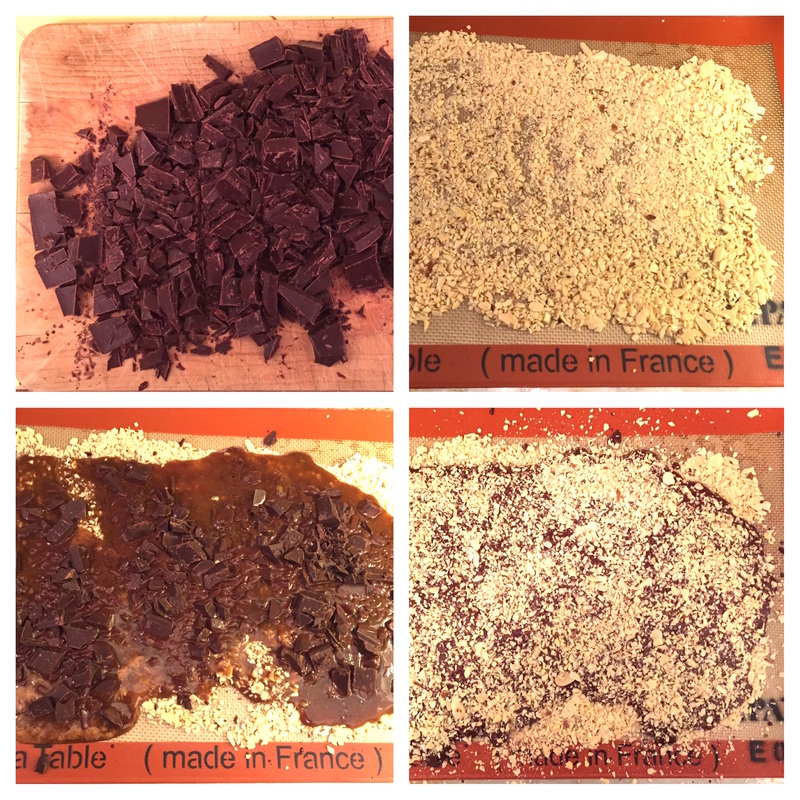 Dust the chocolate with the remaining almonds. 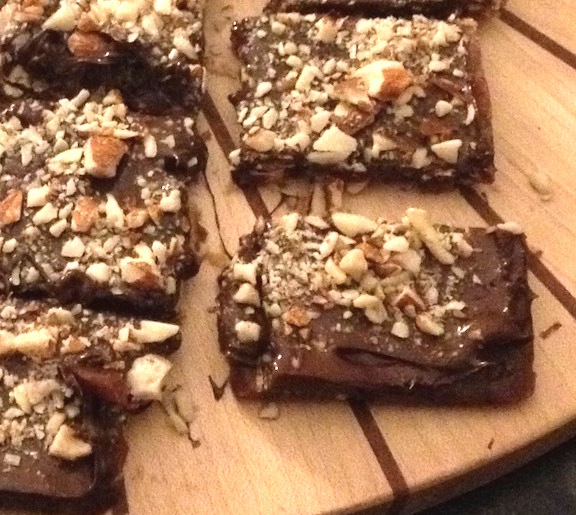 Leave the toffee to cool completely, then break it into irregular pieces, or refrigerate if you just can’t wait. You can store the toffee in an airtight container at room temperature for up to a month. But you won’t have to. I keep it on the counter in a Ziploc bag. It lasts abou t a day and a half. 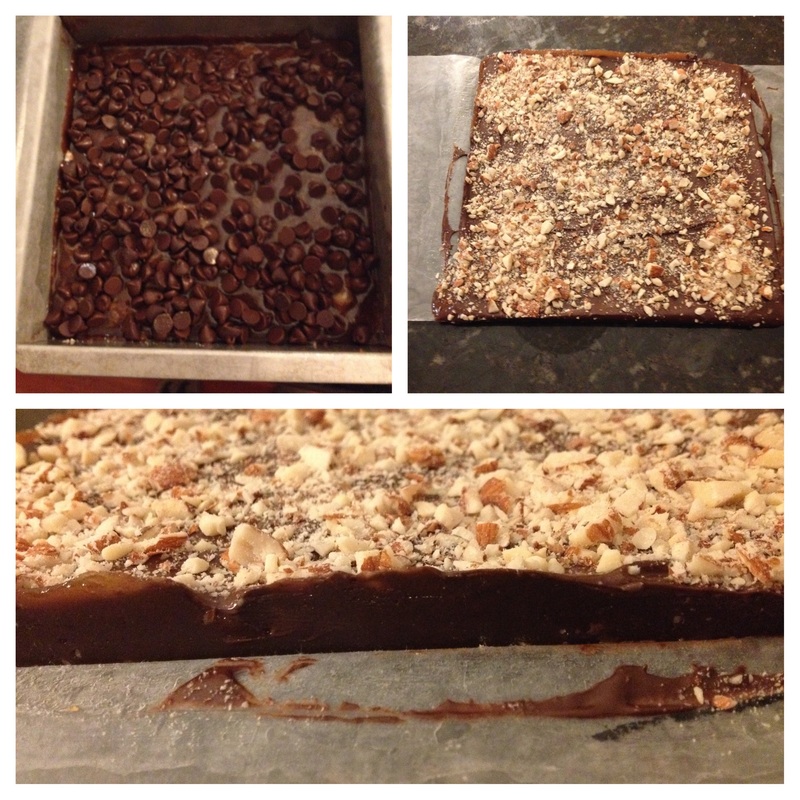 Chunky Toffee: Sometimes I want thick pieces. When I do, I generously butter the bottom of an 8×8 square pan and sprinkle with the nuts. Everything else is the same except I go a little easier on the chocolate. When ready, I poke it sharply with a knife point to break and then go from there. Note: Apparently Rose has updated the recipe in her latest book The Baking Bible. She now puts chocolate on the bottom and the top, as described delightfully here. I was going to title this “The 40 Stroke Brownie” but my editorial staff felt that could go off in too many unintended directions. Whatever. I still feel it’s interesting to note that many, many recipes instruct one to “beat vigorously for 40 strokes.” Not sure where it comes from and a Google search was exhausting scrolling through pages of health-related results. (Point taken, editors!) What I find, though, is that those 40 strokes with a wooden spoon are magical – your batter transforms into something satiny and wonderful. And whatever you’re baking is heightened – heavenly textures. As was the case yesterday when, in mid-afternoon, I was toiling away at my desk and thinking I’d like something chocolate. And knowing there was nothing to be had at the moment (having finished my usually reliable supply of frozen chocolate bars). What to do? Basic brownies. One bowl. 45 minutes from start to finish. Let’s go! 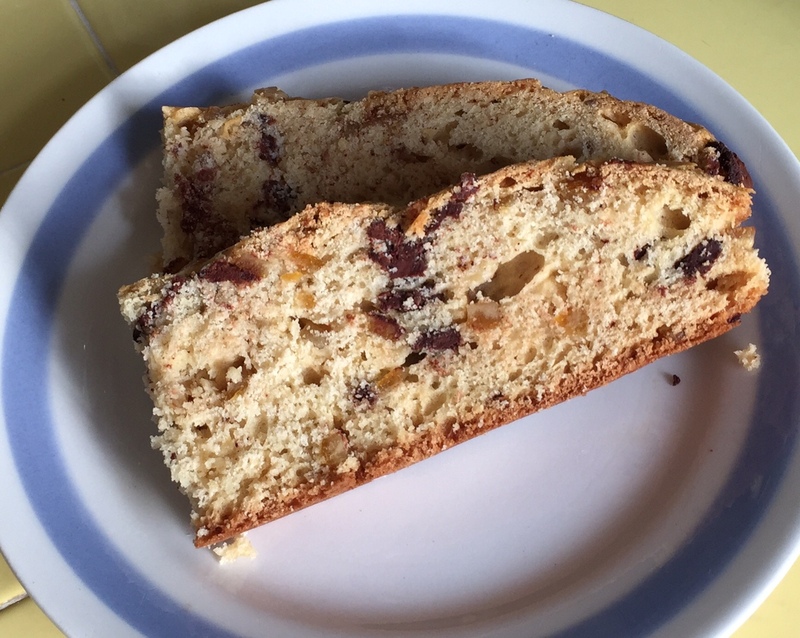 I was interested primarily in speed and ease so considered making from memory the recipe from the Baker’s box. 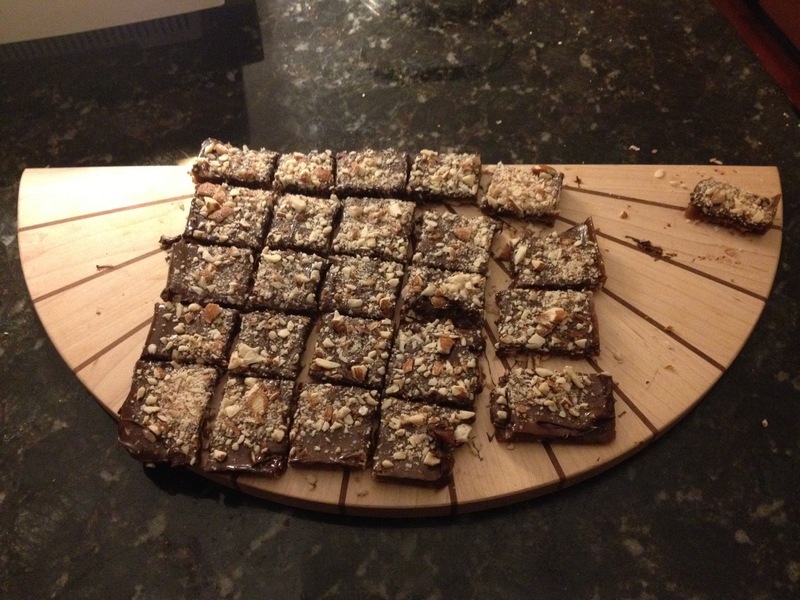 But instead I once again invited Alice Medrich into the conversation and pulled together her Cocoa Brownies tout suite. Because she’s Alice and therefore the bomb, her recipe includes a little discussion about cocoa and the flavor profiles when using natural (nonalkalized) or Dutch-process (alkalized) cocoa. She remarks that Dutch-process cocoa delivers a flavor reminiscent of Oreo cookies. Interesting. I use Droste Dutch-process cocoa and have never noticed the Oreo effect. I have noticed it, though, quite robustly, when using something called “Black Onyx” cocoa. 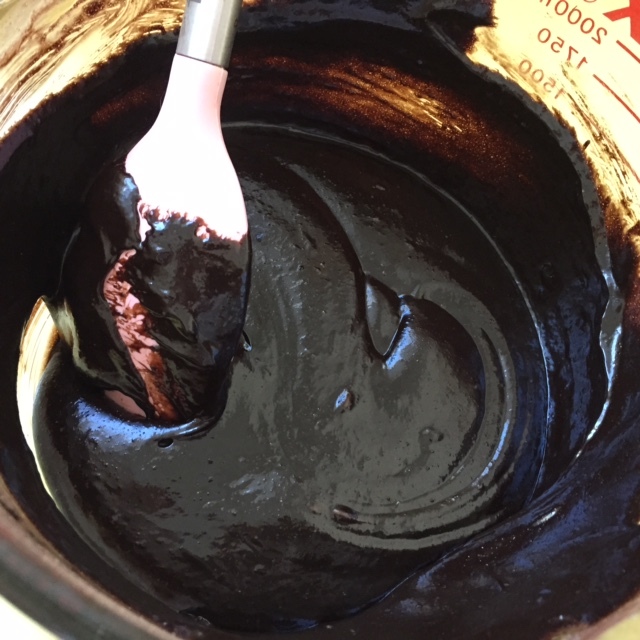 According to the Savory Spice Shop website, “[Black Onyx] has been alkalized to the extreme, producing a dark, purplish black cocoa that makes for an impressive black-as-coal baked good. This extreme alkalization neutralizes the natural bitterness, removing some of its chocolate flavor and a lot of its butter fat (10-12%).” I discovered it at my local heaven, er, specialty food shop, Surfa’s. It’s definitely black and definitely delivers the Oreo notes. You’ve got to be judicious in its use unless you love Oreos that much. Yesterday I was also out of Droste, but did have a tub of Hershey’s cocoa in the cupboard. 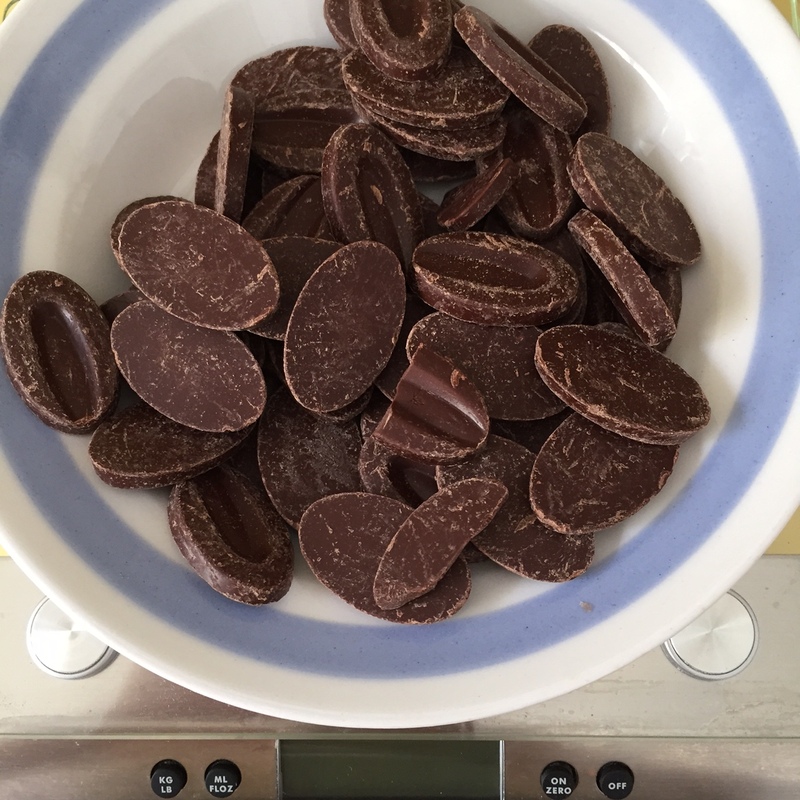 So I measured two ounces of Hershey’s and one ounce of Black Onyx into the recipe. The results? Black as night, Oreo note present and accounted for, moist and slightly chewy texture. And exactly what this hardworking girl needed to get through the afternoon! I do believe it’s those last 40 strokes that make the texture so delightful. Because the brownies are so intensely dark, these would make an excellent Halloween treat with just a single candy corn slightly off center on top. Preheat oven to 325. Butter an 8-inch square pan, or line with parchment or foil, creating overhangs. Set aside. Melt butter gently in heatproof bowl in the microwave. Add the sugar, cocoa powders and salt to hot butter, stir to combine, and set aside to cool until just warm. Stir in the vanilla with a wooden spoon. Add the eggs one at a time, stirring vigorously after each one. When the batter looks thick, shiny, and well blended, add the flour and stir until you cannot see it any longer, then beat vigorously for 40 strokes with the wooden spoon.